Any word what the new spec tire is?!!! USAC Racing Forum > General Chat > Point .25 > Any word what the new spec tire is?!!! Re: Any word what the new spec tire is?!!! Well when the red flag came out it was just on my way and the flagman asked if my driver was ok so I asked what the call was simple as that!!! But had to do it quickly as I walked by because my driver was in turn 4 and had to check if she was ok and the car was ok. So then when I got to the car the only person that was around was the flagman so I asked if I could look at my Micron since I didn't see the race director the flagman has a radio so I asked. I guess if my little girl was hurt real bad I couldn't say a word to the flagman hum. Where do you guys come up with your BS. But setting that BS aside and being at Kokomo racing I would have to thank the president and his followers for putting on a great show and all the people that showed up from the Kokomo speedway stopping by to check out the young guns and still being able to have some fun before going to the speedway for the Kokomo Klash as many of us did. It was great to see several of KQMC's novice drivers move up and a couple come to mind as the Little girl name Molly that runs Jr. Novice this year move up to Jr. Honda class and win a heat race it was so great to see that little girl run as good as she did. 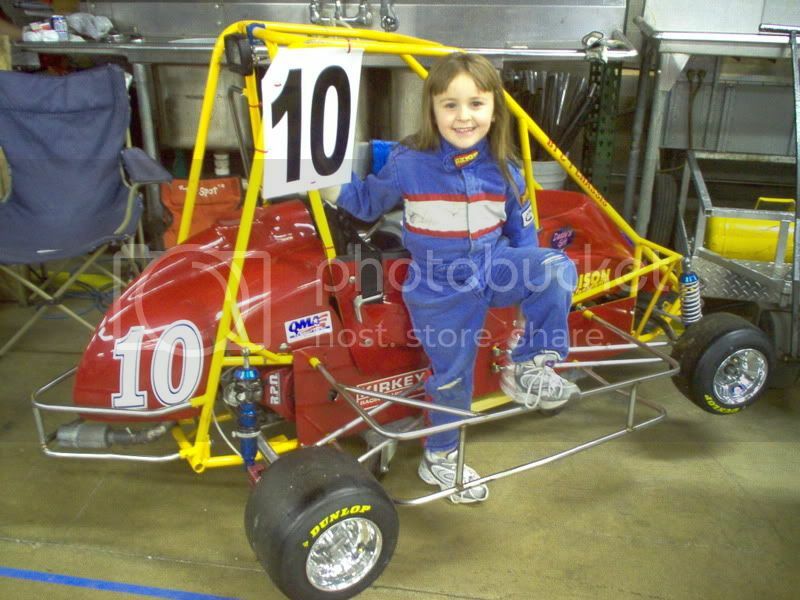 Molly in Jr. novice would take off all year and leave everyone and then when she got to a lapped car would just stop. So in the Jr. Honda heat race see started off and passed a couple cars and then out of no where Molly took off and just started passing like she's be doing this for years and won. Now between you and me I had to stop everything and run over just to she if it was her in the car and wow it was her with the biggest smile a little girl could put on her face. Then after that the first words out of her mouth was DAD YOU OWE ME FIFTY BUCKS!!!! NOW THAT'S WHAT'S RACING IS ALL ABOUT WITH THESE LITTLE KIDS!!! Never said that only thing I can say is I got a hell of a driver and knows her set up. Who knows as other times when something happens like this my driver would like some changes if so I would pull her in and change them. I'm beginning to wonder if you even know what your talking about or on the other hand I'm just wasting my time with you!!! Oh also just got some new tires in for testing so we'll be out there Sat if you want to try your luck again!!! Sounds good I just hope the rain holds off for the weekend!!! The bad part now is that it will take an hour or so before we can practice because I'll have to bring the blower and get all the leaves off the track. But on the other hand that's how Starla learned her line real quick when we started because when the leaves fell I sweep the line and she had no choice but to run the line and we ran for hours that"s why and she knew if she got into the leaves she's was gone!!!! I'll bring my leaf blower too... that way we can practice instead of playing in the leaves all day. Why would you go to the flagger instead of the race director? Tribblewalker has the force, but I cant turn him to the dark side. I will keep trying. MELMO: I don't know I just talked to the flagman!! !